Oke, a Japanese flat-bottomed wooden tub, is made to last many years, being reparied by th emaker when needed. Unlike plastic, wood is an organic material and changes its volume by absorbing and releasing moisture. A well dried oke does not shrink much but can expand or contract with humidity swings. If the contraction of the wood is too much, the hoop around the oke will come off. It can be placed back but will get loose again if the shrinkage is excessive. In older times, the oke was taken to oke-ya, oke makers, for repair. The oke-ya would adjust the hoop and shave the worn-out surfaces clean. This is how the oke should be looked after. When oke-ohitsu is used for freshly cooked rice, it absorbs excess moisture making the taste and texture of the rice just right. The ohitsu should not be wetted before use. 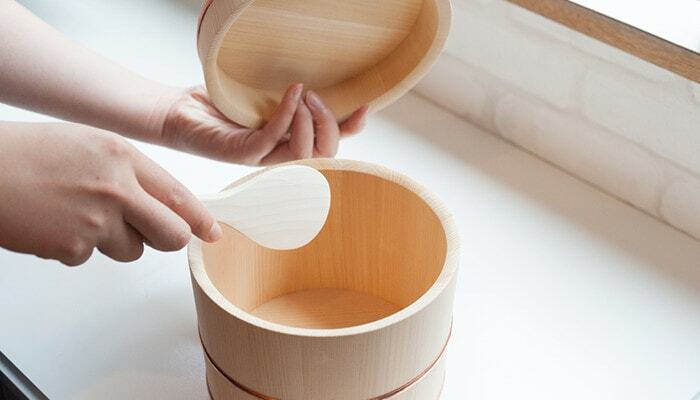 Many ohitsu makers advise to immerse it in water or wipe with a damp cloth but this will make it less effective, since the ohitsu is supposed to absorb excess moisture.